Training visits of Belarusian partners to EU universities. EU programme partners are organising visits to provide to the Belarusian group a full understanding of the way in defining learning outcomes, assessment criteria and teaching-strategy, highlighting in those aspects that could be translated to the Belarusian current challenges and needs, and avoiding emphasize those elements that could be too dependent of the context and consequently less transportable to the Belarusian context. The aim is to show them a world of possibilities, different arrangements, and different structures in order to open their minds on the many different ways in the use of innovative principles and approaches to teaching and learning, strengthening resource and methodological support of education, upgrading and improving the technical base, provision of a variety of education programmes and use of information technologies, and so on. To examine various views of the role of higher education in preparing graduates for works in Belarus. To discuss the teaching and learning approaches in Belarusian universities. To disseminate the relevance in the use of innovative approaches in teaching and learning for the Higher Education System, and in specific for the Belarusian one. To foster relationships and lines of communication with external stakeholders. The seminar aroused great interest among representatives of the scientific and pedagogical community, experts in education, innovative educational technologies, and all those who are interested in implementing the training of qualified graduates of higher educational institutions. It brought together a representative audience: more than 80 representatives of Belarusian universities and their foreign partners from Spain, Finland, Poland, Russia, Lithuania, Latvia, Sweden, Germany, representatives of the Office of ERASMUS + Program in the Republic of Belarus, Ministry of Foreign Affairs of Finland, experts of the European Union project “Employment and Vocational Education and Training in Belarus” etc. took part in its sessions. In each Belarusian participating university has been organised a two-day workshop to formulate their learning outcomes for their study programmes. On average, it was considered up to 40 persons in each workshop including staff from universities, local authorities, employers’ associations, NGOs and any other relevant stakeholder. Four trainers (a combination of 3-personnel staff from EU programme partners, some national experts and one international expert) provided key learning points on the FOSTERC topics. 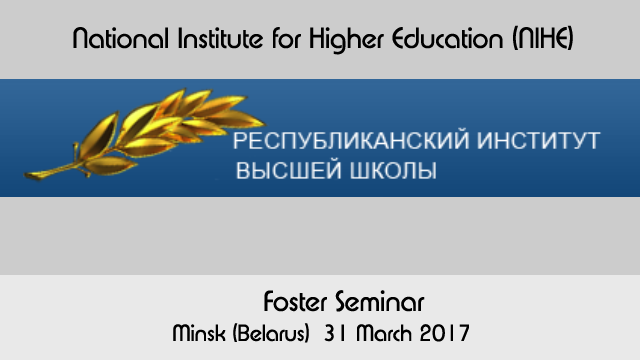 On 31 March 2017, the second FOSTERC Project meeting is going to organise in Minsk at the National Institute for Higher Education (NIHE). Only project partners are invited to attend the meeting. To discuss the results of the seminar and to think about how to proceed with the needs of the Belarusian universities for the implementation of the Bologna process. To approve master questionnaires for graduates, teachers and employers. To review project coordination and financial issues. 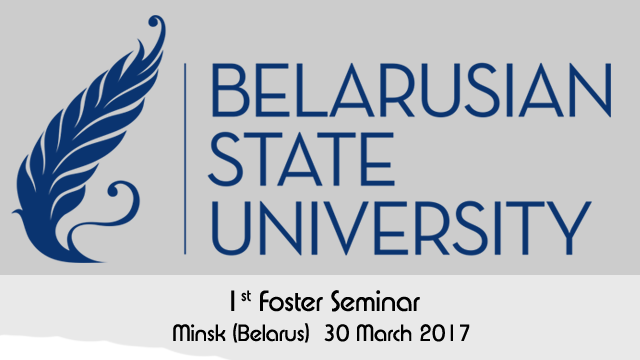 On 30 March 2017, the international seminar "Competence approach in designing educational programs" will be held at Belarusian State University (BSU). The seminar is the first public seminar of the project FOSTERC and open to all Belarusian universities and stakeholders. International/national external experts in the fields are invited to motivate attendants on the relevance in the use of innovative approaches in teaching and learning. Reports elaborated by Belarusian partners and NIHE are going to be discussed, drawing conclusions for the next steps. To discuss the current situation of reforms and needs of the Belarusian universities for the implementation of the Bologna process. To identify high level requirements and issues from team representatives and stakeholders. To disseminate the relevance in the use of innovative approaches in teaching and learning for the Higher Education Systen, and in specific for the Belarusian one. 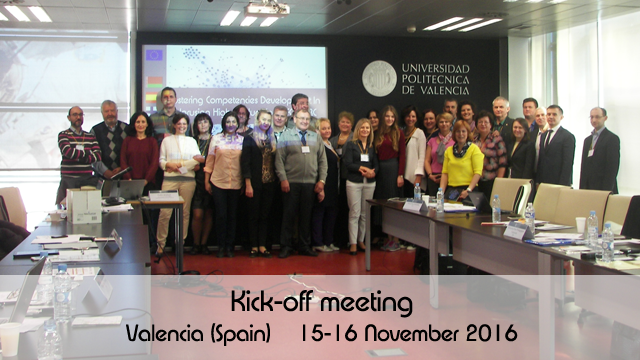 On 15 November, 2016 a new international project “FOSTERC” under the program ERASMUS+ was launched in Universitat Politècnica de València (Spain). The representatives of 5 foreign and 11 Belarusian higher educational institutions attended the meeting. During the event the issues related to the development prospects of the project in our country were addressed and the list of core activities was established. Copyright © 2017. Powered by Ingenio (CSIC-UPV). Ciudad Politécnica de la Innovación | Building 8E 4º | Camino de Vera s/n | 46022 Valencia (Spain)| Phone +34 963 877 048 . All rights reserved.